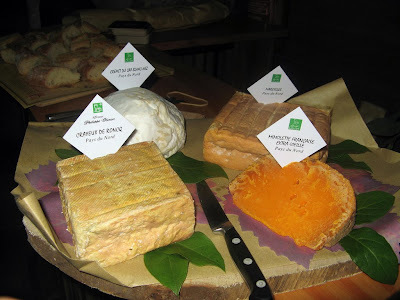 The cheese I really wanted to talk about in this post is a Maroilles. It's a cow's milk cheese made in North-Eastern France and boasts every characteristic I find irresistible in processed milk protein: Soft and spongy, unpasturised, washed-rind, and very, very smelly. The example we were served in a damp basement of La Capsule, a bar in the center of Lille specialising in local artisan beers, was wonderfully tasty, with a deep fresh farmy flavour and nutty aftertaste. I was told the rind was washed in the local beer, local really meaning local in this part of the world where a beer is rarely found on sale more than 20km from the brewery. So a traditional artisan cheese, hand-made and washed with local produce, soft and squishy and smelling like death. I was in heaven. 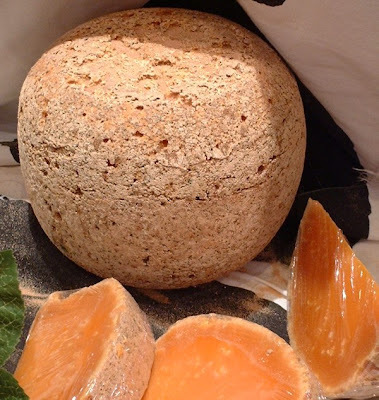 Bearing a very superficial resemblance to an Edam, produced as a ball but with a shockingly orange hue (and thankfully tasting a lot better than the rubbery Edam), Mimolette is a salty, nutty cheese with a solid flesh which hardens and develops a richer flavour when aged. The specimen we tried was "extra-vielle" (very old) and boasted a lovely crumbly texture and strong flavour. You may also know this cheese as "old Amsterdam", which I've spotted in a number of the better cheese shops in London and is pretty much the same style, only (you guessed it) produced in the Netherlands. I only mention this because the Netherlands are a bit of a black hole food-wise (Bill Bailey once riffed very amusingly on their tendency towards cheese and ham toasties and variances thereof) and need all the encouragement they can get. Another point the Mimolette has in its favour is its availability in London - I've seen it in Whole Foods, Hamish Johnston and La Fromagerie whereas the Maroilles has a much lower profile, although admittedly if you can't find a Mariolles I can't see why you wouldn't be just as happy with a Stinking Bishop or Ardrahan. In fact, why not get them all and see which you prefer. I'd love to see the faces on your fellow commuters when you bring back that little lot on the tube in summer. The reason I was in Lille, in case you were wondering, was that I was invited by We Are Social, who are working with Eurostar to publicise their "Little Break, Big Difference" campaign. If the purpose of the day was to convince us that you really could fit a meaningful amount of tourism into a single day along with a return journey from St. Pancras then mission very much accomplished - although if I was to do it again under my own steam (and wallet) I probably would have started a couple of hours later and stayed in France for dinner. I have nothing in particular against 5am starts but by the time the beer and cheese tasting started mid-afternoon I was in danger of slumping head-first into my Crayeux de Roncq. Still, what a way to go. More details and comprehensive photographic evidence of the day can be found elsewhere, and if you want to construct your own mini-break to Lille then return tickets start at £55. It's a smashing little town, well worth a visit if you have even a passing interest in French produce and cuisine, and is only 1h20m away on the Eurostar. Let me know before you do, though, as I may want you to pick up some cheese for me. When I first moved down to London all those years ago I made it a personal mission to work my way through as many of the (literally) hundreds of food delivery flyers that drop through my letterbox every month as I could, with the intention of impressing friends and visiting family members with the best that Battersea takeaway joints had to offer. Unfortunately only a tiny handful are any good. Spice Fusion impressed early on with their strong flavours and generous portions of poppadums, as did the Bombay Bicycle Club, which I'm told Gordon Ramsay is/was a regular customer of, if that's any recommendation. I have however come to the sad conclusion that there are no good Chinese or Thai delivery places, that only the two mentioned out of around 20 Indian deliveries are any good, and it's never a good idea to get a donner kebab delivered, sober or otherwise. 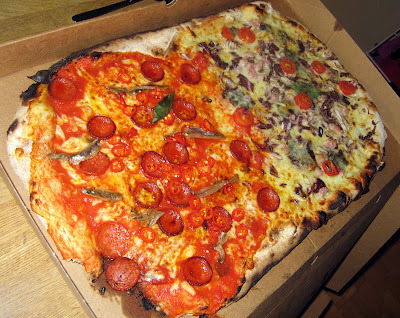 As for pizza, happily there are two excellent options, both on Lavender Hill. My current favourite is Firezza, which as well as delivering piping hot pizzas with excellent bubbly crusts has the most brilliant mobile ordering system: with literally 3 clicks you can send a pizza to your front door - it's dangerously easy. And then there's Basilico, who make actually pretty good Italian-style pizzas and were my favourite pizza suppliers until very recently. In fact, the Basilico Pizza Funghi au Truffle was almost a regular feature in my house, until one day something occurred to me that had been bothering me for a while. There's no truffle in it. I don't mean just no real truffle - I wouldn't expect a £15 delivery pizza to be scattered with Alba's finest whites, nor even the preserved variety at a push (which has a horrible texture anyway). But truffle oil is incredibly potent and can be picked up from Tescos for not much more than a couple of quid, and even a few drops would lend an unmistakable familiar earthy aroma to a pizza. And yet, time after time, the Basilico Pizza Funghi au Truffle would arrive without even so much of a hint of truffle. So one day, I set off up the road to find out what on earth was going on. 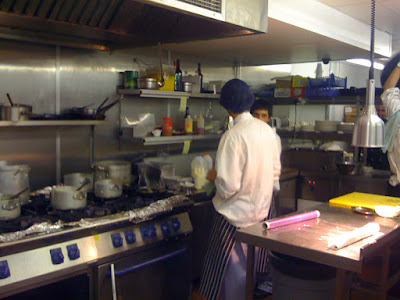 The staff in Basilico Lavender Hill were lovely - helpful and friendly and eager to show me round their little branch. God knows what they thought of the strange man demanding to see their truffle oil but if they were put out they didn't show it. And although I half expected them to make some excuses or even admit they didn't put any truffle oil on the pizzas, they soon produced a couple of bottles - one half-used - of what the label proudly proclaimed was "Italian White Truffle Oil". With their permission, I opened the bottle and took a sniff. Nothing. No truffle aroma at all - not even the faintest scent. The oil literally smelled of nothing - and not even olive oil, just completely inert. I offered the bottle to the guy behind the counter, who agreed with me that it smelled of nothing. I tasted a bit from my fingers - again nothing, just oil. Now, if Basilico are deliberately using fake truffle oil and advertising the pizza as au truffle, then I'm pretty sure that's against the law. If they're being diddled by their suppliers, paying a premium for ordinary vegetable oil that has a 'Truffle' lable on the front, then their suppliers are in breach of the law. If on the other hand - and this is probably the most likely scenario - that Basilico are deliberately using a 'truffle' oil containing such undetectably tiny amounts of the raw ingredient that it's not technically in breach of the law but they're able to use the word 'truffle' on the menu without being sued, then that's just cynical. To give Basilico a fair hearing, I called their franchise manager on the phone, who explained that he'd look into the matter and get back to me. After a couple of weeks, having heard nothing, I called him back and we had a bit of a chat about the fact that I'm pretty sure the truffle oil they were using had no truffle in, and he very unconvincingly maintained that he could smell a "very subtle" odour of truffle in the Basilico oil. I challenged him to tell the difference between that and a normal bottle of vegetable oil. I also offered to meet him at the Lavender Hill branch, and I would bring a little bottle of my own truffle oil by way of a comparison. That was a few weeks ago, and I still haven't heard anything. Something tells me he's not that confident he can tell the difference after all. The result of all this to-ing and fro-ing is simply that they have lost me as a regular customer, which admittedly won't give them too much to worry about in the long-term. But it got me wondering how many other delivery places in London are guilty of embellishments on their menus. There's an Indian takeaway near me that advertises itself as organic - if you ordered a balti from there and the chicken wasn't really organic, would you be able to tell? I certainly wouldn't. Or what if KFC used only 10 different herbs and spices in their "secret" coating instead of 11? Would there be rioting in the streets? It would take quite an imagination to reconstruct the neat little wedge of chocolate pizza that I'm assured this pile started off as at the beginning of its journey, but I'll have to take their word for it. I'm also afraid it's not an idea I can wholeheartedly endorse - if you eat a chocolate pizza like you would a real pizza you'd end up having a LOT of chocolate in one go, and if you didn't, well, what's the point in it being pizza-shaped? But perhaps I'm missing something. The chocolate tasted nice, so, yeah. Good luck to 'em. There is a person on Twitter who posts under the screen name @hestonblumenth. Foodies and fans alike were understandably excited when he joined in May this year, and he quickly gained a substantial following of 5000 or so people, including me. His posts initially seemed innocuous if slightly bizarre, mentioning what he'd had for lunch or his plans for the menu at the Fat Duck, and we all giggled along at his updates, imagining the mad professor character we'd grown to love from his TV shows, alone with a laptop late at night, spouting his eccentric philosophies in between mouthfuls of snail porridge. And then gradually, his tweets turned slightly more sinister. Now I don't know Heston Blumenthal personally, only through his television appearances and his excellent cookbooks, but the Daily Mail-inspired, intolerant bigot that occasionally vented forth on Twitter seemed harshly at odds with the thoughtful, gentle and well-educated person who presented In Search of Perfection. Sensing something wasn't right, a fellow Twitter user @ianashworth emailed the front of house at the Fat Duck, and received a reply almost immediately. It wasn't him, and they were working to "hopefully" have that Twitter account disabled. This was confirmed again at an event held by the Guardian newspaper for food bloggers and restaurant PR people, where Monica of Lotus PR - who represent the man himself - announced that he's not on Twitter but may be persuaded to join very soon. So, case closed, you might think. Lovinf the non PR comments. Dont ever prove yourself - unless you want to give me a table. I got one once but was too ill! "Don't ever prove yourself" - what an extraordinary thing to say. There's almost a religious zeal to this person's refusal to even entertain the idea that it isn't him, and not only that he's deliberately asking for the truth not to be revealed. He's happy as he is, ignorant and credulous. There's a parallel with the characteristics of those who claim spiritual faith that's impossible to ignore - who wants the truth when the lie is so much more comforting? It is, however, only the minority that have reacted like that. Most are happy to accept the truth, and in some cases pretty relieved that this hate-fuelled caricature is quite distinct from the genius chef they know and love. And you may think I'm being a bit petty in taking this issue so much to heart, but I happen to genuinely admire Heston Blumenthal and his achievements as a chef, and when I see the damage being done to his image by some anonymous moron with a chip on his shoulder, it makes me wince. As of today, 5632 people are following the fake Heston's updates, a depressing number cheering on each reactionary outburst with a chorus of "Top man! You tell it like it is" and "Good with food and good sense, a winning combination. I totally agree with you.". Let's hope that Twitter get their act together and disable the account before any more damage is done. And I suppose while you're here, you might as well follow me, too. Happy tweeting. Edit: Removed one of the credulous Heston followers' comments after she started furiously DMing me. I tried to make the point that if you don't want something to be public, don't post it on a public forum. But there's no arguing with some people. Edit 2: As of 21st August, the fake @hestonblumenth account has finally been disabled by Twitter. 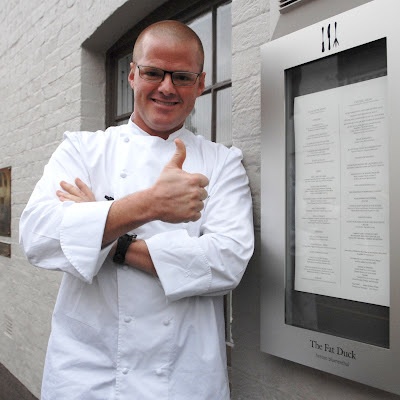 Edit 3: And on 4th September, the Real Heston was finally welcomed to Twitter as @HestonFatDuck. I should be flattered, really. Now that the blog is getting more widely read, I'm getting a lot of invitations to press launches, tastings, that kind of thing. I read them all, and I first check whether or not they're on in the daytime while I'm at work (they usually are) and whether or not they appeal (they usually don't). But one arrived in my inbox a month or so ago that caught my eye - something about a mango tasting, forwarded on from a fellow blogger who couldn't make the date. Steak tasting, check. Cocktail tasting, check. Mango tasting. Fine, sign me up. And then some worrying signs began to appear. The girl organising the evening wanted biographies from each of us. "The bio will be printed and passed around to the audience, and also used to introduce you as panelists." Wait, audience? The word "panel" as well - I'd assumed it was a group of interested parties trying out different types of mango, and now suddenly it's Question Time? No, couldn't possibly be. I put it to the back of my mind. Skip forwards a few days, and another email. "We very much look forward to welcoming you at Asia House for our first event dedicated to mangoes and supported by the Pakistan High Commission. The event will start at 6.45pm but we would request you to come around 6pm for a technical check. Would that be possible?" Bit weird, but yes no problem. I'm afraid I had no background in sound rigging or event organising, but anything to help. And so we turned up. There was mild confusion at the door at Asia House because we (and by "we" I mean me and the other food bloggers invited to the event) didn't seem to be on the guest list. I spent a few moments frantically flipping through the clipboard at reception, but we were definitely not mentioned anywhere. I was slightly put out, and just pondering leaving and spending the evening in the fantastic Sam Smiths pub next door, when the event organiser appeared and ushered us upstairs. Phew, we're in! 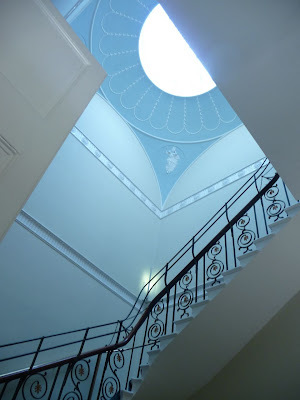 We strode up the wide staircase of this fine Georgian townhouse into a room full of around 150 or so chairs all facing a stage beneath a huge projector screen. I was ushered towards the stage. "And so this is where you'll be sitting". There's a pause. Eventually I turn to her. "Sorry, me?" And then the full, horrific reality dawned on me. The panel. That was me. I was on the panel. ****. The previously excited banter between the bloggers gained a panicked note, as what we had "agreed" to became terrifyingly apparent. Through the sound check and run-through, the atmosphere of formal tension grew and smiles from everyone - bloggers and harried staff members - shrunk. "I normally come on to Eye of the Tiger, if that can be organised." I quipped in a vain attempt to lighten the mood. No reaction. ****. 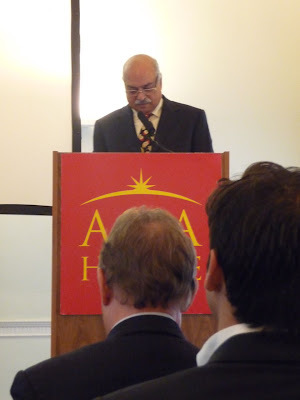 Barely 30 minutes later, the audience of important-looking Pakistani ex-pats and paying guests arrived and we reluctantly took our chairs on stage. 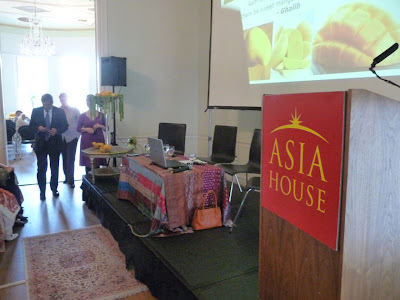 The chairman of Asia House introduced us all the best way he could (we are food bloggers, and we're not famous - and with the exception of Oliver Thring, who has written two superb pieces for the Guardian blog, we are not paid for our food writing) but really, I am not a public speaker. And I don't know much about mangoes. 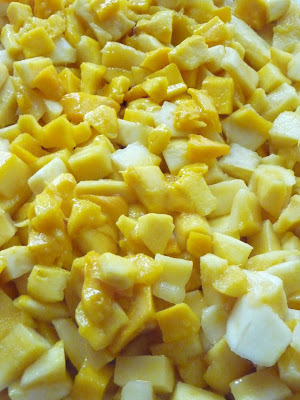 In fact, I don't even LIKE mangoes very much - they have a weird stale smell and the flesh is all slimy. And I now find myself sat in front of a quite substantial audience asked to make a pertinent comment about mangoes before the High Commissioner of Pakistan and a row of angry bored journalists from the Times and the Guardian and the Telegraph who audibly sighed as soon as they heard the word "blogger" and wanted to be out of there as soon as they possibly could. It was excruciating. I waffled for about 30 seconds about Tayyabs being my favourite restaurant and how nice their mango lassies are and then stared desperately at the host to switch the focus to someone else. Essentially, I have nothing new or pertinent or relevant to say about mangoes. I just don't. I know people rave about them and I do occasionally see the attraction but... I shouldn't have been there. I didn't understand the format of the evening, I didn't want to be a public speaker and I don't give a flying crap about mangoes. And yet there I was, in front of 150 or so paying guests, expected to be entertaining and informative about a fruit I've eaten only a handful of times in my life. I wanted to fold in on myself and disappear. So eventually it was over, and the "panel" stepped down from their stage and joined the hungry throngs at the buffet. I knew it had not gone well. Nobody was looking me in the eye, and the organiser was strangely absent. But how could it have gone well? This is not what I do - this is not what any of us do. I am not a public speaker and I am not an expert on mangoes. Surely, if you're organising an evening including a lecture on mangoes the first thing you need to do is recruit people who can do public speaking and people who know about mangoes. I have a day job, and blogging is a hobby. Humiliation in front of 150 people is not something I would ordinarily seek out - I would find it far easier to strip naked and stroll down Clerkenwell Road if that was what floated my boat. The "panel" huddled in a corner of the room and nibbled on the buffet treats. "This pickly cucumber stuff is nice. What is it?" I asked out loud. "That's mango", was the reply. I quietly gathered my belongings and slinked out. I was baffled. I just couldn't fathom how they envisioned the evening panning out or why anyone would pay for my cringeingly amateurish comments. Why invite three bloggers as well? Why not a mango importer, a scientist to offer some comments on the nutritional value of mangoes, and an after-dinner speaker or food author to add some witty balance? The answer, I suspect, is cost. I didn't charge. And you get what you pay for. Still, you live and learn. I'd be interested to read how the other bloggers (Niamh Shields of eatlikagirl was the third victim) felt about the evening, and (with a due sense of trepidation and dread) even the audience. Perhaps - just perhaps - I'm being too paranoid and we all came across as exciting and informed and everyone, including the cynical dead-tree journalists, had a good time. But my instincts are screaming otherwise. Clapham Common has its Trinity, East Dulwich its Franklins, New Cross its Chicken Cottage. Local restaurants that cater to local tastes - good value, informal and tasty. And Balham, for many years now, hidden away from the prying eyes and fads and fashionable foodie trends of the rest of the capital, has had Lamberts, a friendly boutique spot 2 minutes walk from the station. One of the blessings of visiting a restaurant you know next to nothing about is an open mind - an open mind that too often in this city is closed within minutes of arrival. But fortunately, and delightfully, Lamberts turned out to be rather good. 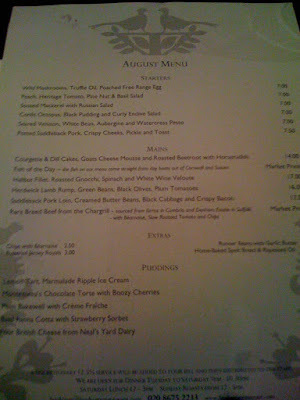 There were lots of things to get excited about on the menu last night. Crispy pork cheeks, wild mushrooms, halibut fillet - a step up from the kind of ingredients you normally get chucked at you in this price range (£7 starters, £14-£17 main courses). Already things were looking up, and this was despite the frankly bizarre decision to supply rapeseed oil in which to dip our (admittedly quite nice) house bread. The oil smelt, and tasted, of nothing - like cooking oil. Very unpleasant indeed. All was forgiven with the arrival of the starters. My venison was divine - mostly carpaccio-rare but with enough searing on the extremities to bring out an astonishing strength of flavour. Beneath the deep red flakes of Bambi was a robust bean and aubergine pesto, notable in being the only aubergine dish I've been excited about in many years. Topped with baby watercress, this was a colourful and balanced plate of food, and a real achievement for £7. Similarly, a friend's octopus and black pudding was also a triumph, surf and turf Mediterranean bursting with fresh flavours. The main courses, then, had a lot to live up to, and only just fell short. My lamb was perfectly cooked and seasoned, served on top of pleasantly crunchy beans and surrounded by nice soft boiled potatoes. 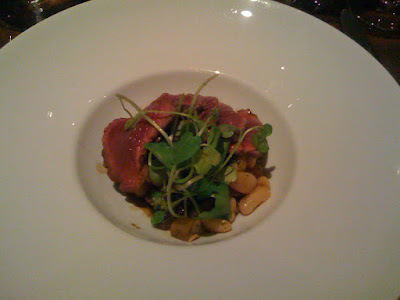 It was competent where the starter had been exciting, and traditional where the venison was innovative. Of course, that's not to say I didn't enjoy it - I did - but this was more the kind of food you could get at, say, a decent conference banquet or 4-star hotel restaurant than the fireworks evident in the venison dish. Chips were good though. 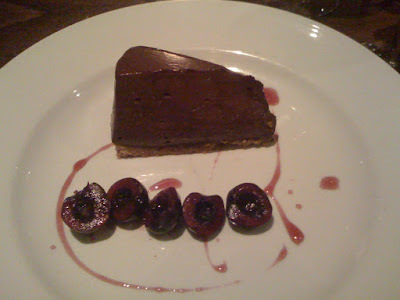 For dessert, a huge slab of Montezuma chocolate torte arrived, next to a neat row of raw cherries steeped in alcohol. I'm not the world's biggest chocolate fan (no I don't know why I ordered it either), but even so this plate of food needed something additional - either ice cream or double cream - and the cherries were disappointingly bland. 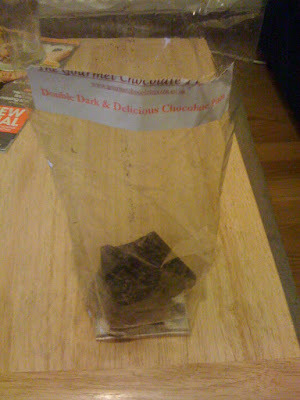 The chocolate itself was nice enough, but not so brilliant as to lift it into a successful dish. I imagine some people who favour chocolate above any other material on earth would think it was great, so I won't be too harsh, but it didn't really do much for me. 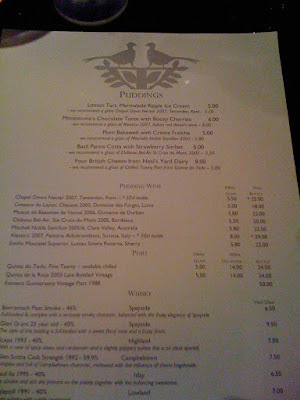 With a bottle of Pinot Noir and the suggested glass of Aleatica Italian dessert wine (£8, notes of blackberries and blueberries and dark summer fruit), the bill came to around £50 each. Perhaps not as cheap as I was expecting at first, but still very good value for cooking of this standard and it's not like we held back on the alcohol. Meals like this, in restaurants like this, give a warm fuzzy feeling inside - it makes me happy that Lamberts exists, and even more happy that on a muggy midweek in August almost every table was taken. There's hope for our fine city yet. Let's get the elephant in the room out of the way before we go any further. Goodman, although it pains me to my very soul to say it, is better than Hawksmoor. A greater variety of steaks, their own ageing room and a couple of top-end Josper oven grills in the kitchen all combine to produce a dining experience which is as close to The Real Deal as it's possible to get in London, perhaps Europe. And not only are their steaks of sublime and unsurpassed quality, their staff knowledgeable and enthusiastic and the infrastructure solid, but they do all this in the centre of Mayfair at a price which even without any special offers or discounts can genuinely be described as a bargain. Any restaurant - even any good restaurant - has some serious competition in this area of town. I started my evening, given that as per usual I'd arrived far too early for my reservation, in the Polo Bar, 2 minutes walk away on Conduit Street, and on the short hop to Goodman I passed Sketch, Wild Honey, Patterson's and Hibiscus, all big-name restaurants. 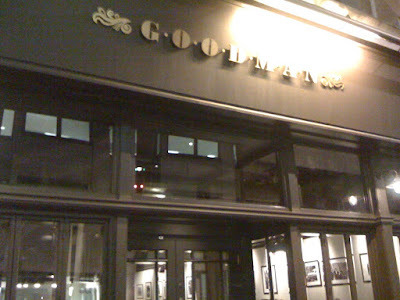 But Goodman is not a Michelin-chasing temple of haute cuisine and doesn't pretend to be. In the fine US tradition, it is an accessible and informal space, looking at first glance an awful lot like a branch of All Bar One - masculine and rowdy and dark. There are no tablecloths here, no thick carpets and no cognac trolleys. It's all about the food, and the food is all about the steak. 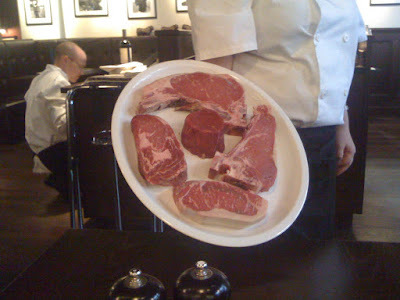 David Strauss, restaurant manager and Keeper Of The Holy Ageing Cupboard, suggested a selection of 3 quite different steaks (all from master butcher Jack O'Shea) in order that we appreciate the differences between the producers and cuts. After very little deliberation, we agreed. What arrived was a large plate groaning with meat, sliced very handily into bitesize strips, Luger's style. My least favourite (brace yourselves) was the UK grass-fed sirloin, which was rather watery on the tongue and with not enough juicy fat, although perhaps I just got a particularly lean example. 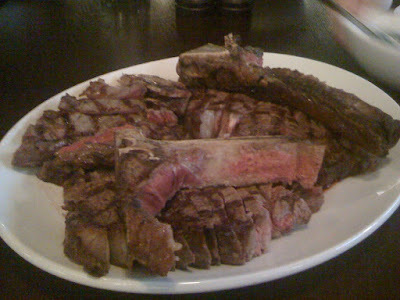 Better was the Irish Black Angus ribeye, with a deeper, richer flavour and some lovely bits of crispy charred fat. But the clear winner, the gold standard of beef, the king of cows, was a USDA Prime New York Strip steak (better known over here a porterhouse). This was extraordinarily good - a rich, minerally flavour combined with a startlingly tender texture which dissolved in the mouth. So not only is Hawksmoor no longer my favourite steakhouse, but I have the further ignominy of realising my favourite steak is grain-fed and flown in from the US. It's just not fair. The sauces which accompanied the steaks were similarly accomplished. 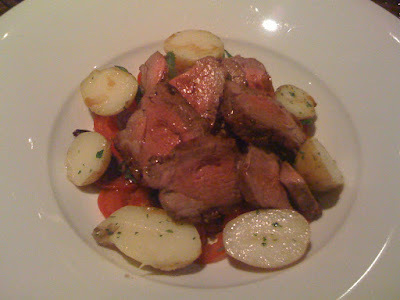 Black pepper was pleasingly fiery, the béarnaise was rich and light, the red wine and veal stock jus silky and moreish. 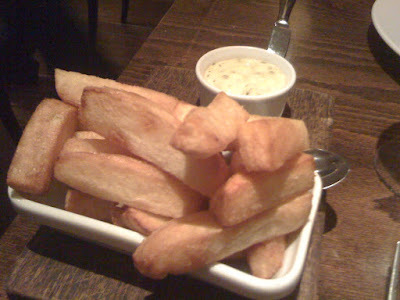 Only the chips were a let-down, cooked well but in old or inferior oil and not very pleasant unfortunately. Creamed spinach was pleasant enough though. I don't think I've ever leapt out of my seat faster than when David suggested a tour of the kitchen. 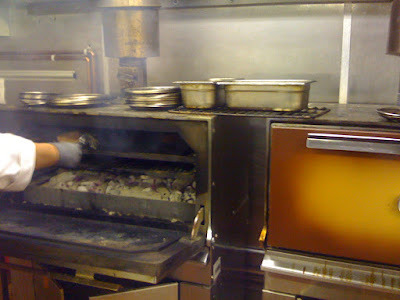 Downstairs at Goodman a half dozen or so chefs toil near the heat of two mean-looking Josper grills which, Dave was eager to point out, are fired only using charcoal and not gas or electricity. 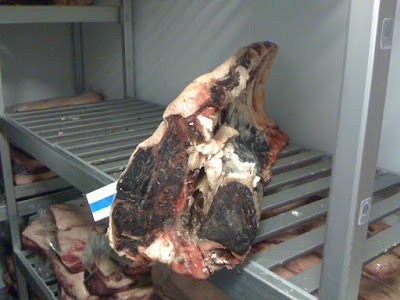 Nearby was the ageing room, whose shelves were stacked with blackened chunks of seriously old meat. 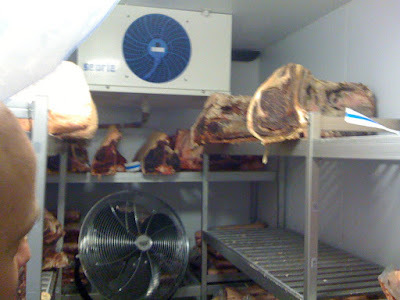 As blogger, author and fellow steakhouse groupie Simon Majumdar said, "That meat room is where I want to move when I leave this flat". Imagine being a Beatles fan in a room of original signed copies of all their albums, or a comic book enthusiast allowed to roam around a library of Superman No.1s. It was brilliant. After all that excitement, and all that steak (some of which they kindly wrapped up in foil for me to take home, there was so much of it), all that was left was the bill. 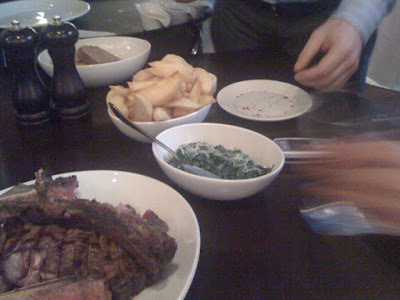 Bear in mind we'd had three glasses of excellent full-bodied Argentinean Malbec, a glass of Jurançon to finish, chips, spinach, sides, bread and more top-quality steak than we could even finish, when I tell you that the final bill came to around £50 each. That, while not being a cheap dinner, is stunning value for money when you consider the amount of food we'd eaten and the quality of the produce. As you can probably tell, I thoroughly enjoyed myself at Goodman. I will continue to be a loyal regular at Hawksmoor, because after all it's still a smashing steakhouse and it's a lot handier for me in terms of location. 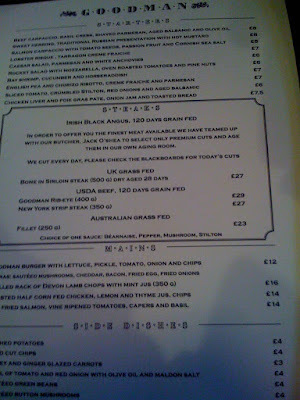 Also - and Goodman are possibly missing a trick here - they have a great cocktail menu. But in terms of technique, service and yes, even value, Goodman currently have the edge over anywhere else in town.